America's Credit Rating On The Line As Debt Ceiling Deadline Approaches : The Two-Way Congressional leaders are trying hard to assure the financial markets the United States isn't about to default on its debts, but tweets by President Trump suggest the vote may not go smoothly. President Trump meets with Senate Majority Leader Mitch McConnell and House Speaker Paul Ryan during a budget discussion in March. With the federal government getting closer to running out of cash to cover all bills on time, companies that evaluate bonds are having to consider how to rate America's creditworthiness. And their job didn't get any easier on Thursday when President Trump continued his attacks on congressional leaders over their failure to raise the federal debt ceiling. Other U.S. officials have been trying reassure the financial markets that no default is imminent. But in a morning tweet, Trump blamed the two top Republicans in Congress — House Speaker Paul Ryan and Senate Majority Leader Mitch McConnell — for not attaching the debt-ceiling legislation to a popular bill on veterans' benefits. Whether that legislative strategy would have worked cannot be known. Further, attaching the debt ceiling to the veterans bill could have endangered one of the few legislative achievements Congress could claim in the midst of the GOP health care failure. In any case, Congress now has just a few more weeks to raise the debt ceiling, which would enable the government to continue borrowing enough cash to pay all of its bills on time. If it doesn't do so, the government will have to prioritize which of its bills it will pay. That would have enormous consequences in the financial markets. Ryan and McConnell have tried to send a message that a debt default is highly unlikely. "We will pass legislation to make sure we pay our debts and we will not hit the debt ceiling. We'll do this before the debt ceiling," Ryan said during a visit to a Boeing plant in Washington state Thursday. "There are many different options in front of us on how we achieve that." Treasury Secretary Steve Mnuchin has offered similar assurances. "We're going to get the debt ceiling passed," Mnuchin said Monday at an event in Louisville, Ky. "Everybody understands this is not a Republican issue; this is not a Democrat issue. We need to be able to pay our debts." 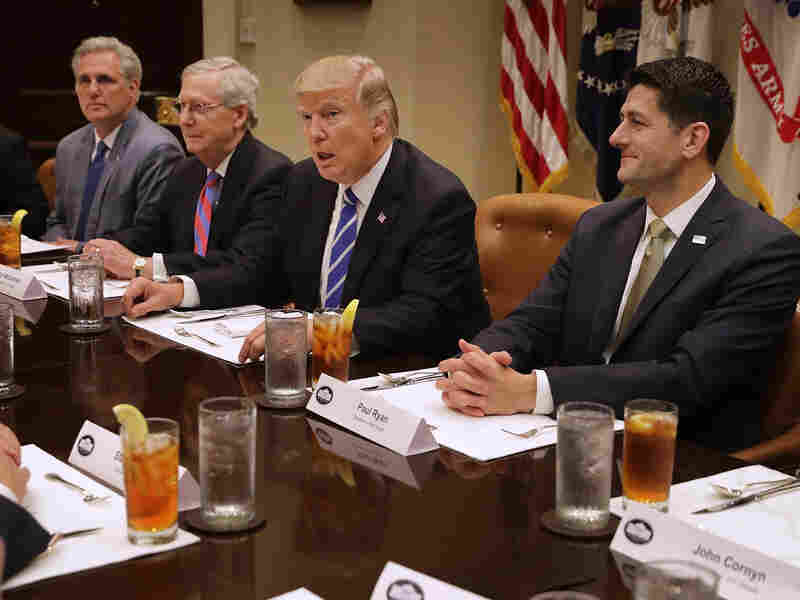 But Trump's attacks on Ryan and McConnell have raised questions about whether the passage of debt-ceiling legislation will be as smooth as congressional leaders hope. Under President Barack Obama, the White House and Congress often engaged in brinksmanship over whether to raise the debt ceiling, but they always managed to do so at the last minute. "Clearly we've had dozens of occasions when the debt limit has been raised in the past, and we don't expect this time to be any different," says Charles Seville, senior director at Fitch Ratings. "Not passing a debt limit hike in time would have an even greater impact on financial markets because when we did this in the past you had a Democrat in the White House and Republicans controlling Congress and people could basically understand the political aspects of what was going on. There was a mating dance and a conclusion. "This time it's Republican versus Republican. I don't know how anyone can interpret that. Is this some kind of mating dance again? Or is it some more critical failure of government? I don't know how to answer that. There is a potential for more volatility this time around than there might have been in the past." Bernstein believes Congress will ultimately vote to raise the debt ceiling. Moody's Investors Service said Thursday it would consider stripping the United States of its top rating if it were to default on bondholders, but not if it merely skipped paying some of its nondebt obligations. But Fitch Ratings took a tougher stand, warning that even a debt-ceiling standoff, short of a bond default, could cause it to reassess the credit rating of U.S. Treasury debt. That's because it would raise questions about the ability of the U.S. political system to get its house in order, Seville said. "One thing that we have in the back of our minds is how the U.S. deals with its fiscal challenges and whether the policymaking process works," he added.